The Affinity Data Bank (ADB) is a suite of user-friendly tools designed to make the latest and most accurate protein-DNA and protein-RNA binding prediction tools accessible to all scientists. The ADB also includes tools to predict in vivo binding due to chromatin accessibility as well as differences in binding due to SNPs and other polymorphisms. The ADB aims to integrate the most useful information from Entrez, Pfam, InterPro, and the PDB to help scientists find functional binding sites, functional SNPs, potential binding proteins, and differences in binding across protein families. In addition, our tools provide scientists with access to a wide range of affinity models including PWMs, PSAMs, and (dinucleotide) FSAMs. Also, pHMM support for modeling variable-length motifs is planned for the next release. The ADB also supports all the major model formats including Jaspar, MatrixREDUCE, FeatureREDUCE, CIS-BP, Uniprobe, and Biojava. The ADB Biophysical Brower can seamlessly access all the UCSC genomes, gene annotations, and mapped polymorphisms – including from dbSNP. Using our browser, you can predict in vivo binding due to protein concentrations, genetic polymorphisms, epigenetic marks, and chromatin accessibility. The new Universal Sequence Logo Tool produces publication-quality logos that integrate high-order sequence dependencies and corresponded positions for PWMs, PSAMs, Di-PSAMs, and pHMMs. Currently supports DNA, methylated-DNA, RNA, and methylated-RNA binding models. The Affinity Inspector provides scientists with tools to interrogate the specificity characteristics of an affinity model with seamless integration with Pfam, Entrez, and the PDB. Tools include specificity & structure mapping, affinity landscape & tetrahedron plots, Pfam alignments, dinucleotide corrections, and lists of affinity-sorted binding sites. 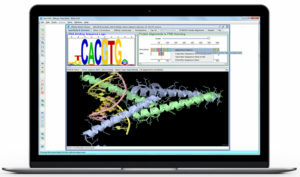 The Affinity Comparator is designed to graphically interrogate the differences in specificity between proteins within or between protein families. Tools include 2-D and 3-D Affinity Scatter Plots, Affinity Fold-Change Surface & Curtain Plots, and Affinity Change Tetrahedron Plots.